Probing Mars; super rad-hard Intel chip; nano-satellites. Equipped with a CCD camera, a temperature probe and a seismic instrument, NASA’s robotic system or lander recently landed on Mars. 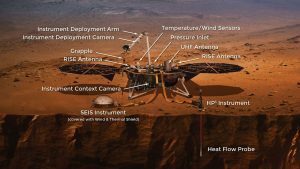 On Nov. 26, the robotic system–dubbed the Interior Exploration using Seismic Investigations, Geodesy and Heat Transport (InSight)–landed on Mars after nearly a seven-month, 300-million-mile (485-million-kilometer) journey from Earth. The lander touched down near Mars’ equator on the western side of a lava formation called Elysium Planitia. The two-year mission is geared to study the deep interior of Mars. The landing signal was relayed to NASA’s Jet Propulsion Laboratory (JPL) via two small experimental Mars Cube One (MarCO) CubeSats. They were launched on the same rocket as InSight and followed the lander to Mars. InSight made an apparent safe landing. One of the first tasks of the system is to deploy its two decagonal solar arrays, which will provide power. 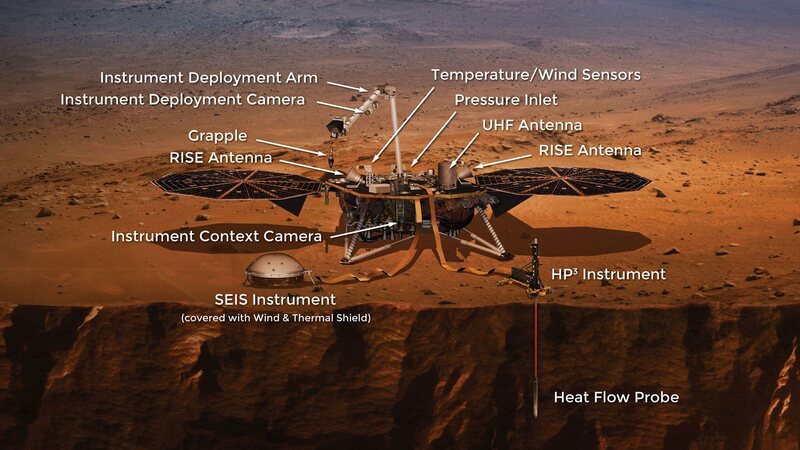 Then, NASA will begin to deploy InSight’s 5.9-foot-long robotic arm. The arm is equipped to take images of the landscape. Teledyne DALSA, a Teledyne Technologies company, is participating in the InSight program. In partnership with the JPL, DALSA is providing the color CCD image sensors for both the Instrument Deployment Camera (IDC) and the Instrument Context Camera for the system. The camera on the lander’s arm will provide 3D color views of the landing site and instrument placement. Later, the arm will deploy the mission’s main science instruments–the Seismic Experiment for Interior Structure (SEIS) and Heat Flow and Physical Properties Package (HP3). SEIS is a round, dome-shaped instrument that sits on the surface of Mars. It will monitor the seismic vibrations of Mars. The HP3 will burrow down to almost 16 feet (five meters) into Mars’ surface. It will measure the heat coming from Mars’ interior, which will reveal how much heat is flowing out of the body of the planet. “We know that Mars’ interior is not as warm as Earth’s, but we’ve never taken the planet’s temperature. HP3 will take Mars’ temperature, tell us how much heat is leaving the planet, and whether Earth and Mars formed from the same stuff. That’s key to learning not only about Mars, but about how all the rocky planets of the solar system formed and evolved,” said Tilman Spohn, principal investigator of the HP3 team. Using a particle accelerator from CERN, the European Space Agency (ESA) has subjected Intel’s computer vision processor to one of the most energetic radiation beams available on Earth. The ESA hopes to use Intel’s Movidius Myriad 2 vision processor in space. The processor will perform in-orbit image processing in future space missions. The Myriad 2 makes use of artificial intelligence algorithms. It can be pre-trained with data to recognize patterns and perform in-depth 3D sensing. But like all hardware, the device needs to be tested against radiation. Space is riddled with charged particles from the Sun and other objects. This test took place at CERN, the European Organization for Nuclear Research. The device was put in a path of an experimental beamline fed by the Super Proton Synchrotron (SPS) particle accelerator. 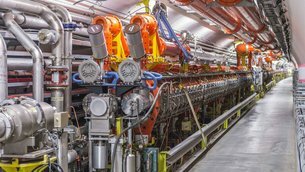 Located in a circular tunnel nearly 7 km in circumference, the SPS is CERN’s second largest accelerator after the Large Hadron Collider (LHC). A rad-hard Myriad 2 could solve several issues. “AI is a way of boosting the performance of any system with a camera in the loop,” said ESA on-board computer engineer Gianluca Furano. The Indian Space Research Organization’s Polar Satellite Launch Vehicle (PSLV-C43) recently launched 31 satellites in Sriharikota, India. The PSLV-C43 lifted off and later ejected India’s Hyper-Spectral Imaging Satellite (HysIS) into orbit. Later, 30 foreign satellites were injected into their intended orbit, including so-called micro- and nano-satellites. Two of those nano-satellites are developed by Spire Global as part of ESA’s ARTES Pioneer program. The shoebox-sized satellites will be used for space-based radio occultation, which the process of using satellites to measure how GNSS signals are refracted by the Earth’s atmosphere. These measurements will provide temperature, pressure and humidity information for weather forecasting and climate change monitoring. Mark LaPedus is Executive Editor for manufacturing at Semiconductor Engineering. Experts at the Table, part 1: Shrinking features isn’t enough anymore. The big challenge now is how to achieve economies of scale and minimize complex integration issues. Explosion of data is forcing significant changes in where processing is done. EUV is the clear winner down to 5nm, but what comes after that may be a combination of tools and techniques. New market opportunities and global competitiveness are limited by qualified people. Researchers digging into ways around the von Neumann bottleneck. Better algorithms and more data could bolster adoption, particularly at advanced nodes. 30 facilities planned, including 10/7nm processes, but trade war and economic factors could slow progress. What’s the Right Path For Scaling? New architectures, packaging approaches gain ground as costs increase, but shrinking features continues to play a role.